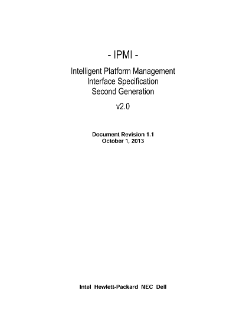 The document provides the Intelligent Platform Management Interface (IPMI) Second Generation Specification, V2.0, rev. 1.1, markup for rev. 1 through rev. 5 of the IPMI V2.0/V1.5 errata addendum. Read the full IPMI Specification, V2.0, Markup for Addendum, Rev. 5, Document.